After applying our our checklist to several Central and South American countries and choosing Panama, the next phase of Operation Expat was an official reconnaissance mission to scope out areas where Ken and I would live our Panama expat life. It went down at the tail end of the rainy season. We had one four-wheel drive and 10 days to check out 10 places. Other than our plane tickets and rental car, no reservations were made in order to maintain maximum flexibility. The internet is infested with exaggerated sales pitches that can make everything sound incredible and everywhere sound like Paradise. Two of the takeaways from this mission were to unsubscribe to a certain popular expat publication and stop wasting time on websites that stood to profit in any way from our decision. LESSON #1: The best expat information sources are those that do not stand to profit from any aspect of your decision. And, if you do end up in Panamá, it would be fun to meet in person some day where our dreams came true! Speaking of intentions, it is absolutely not my intention to turn you on or off to a particular place with this post—I am simply here to share our process in the hopes that it will help you continue yours. If I say we had zero interest in a place, it does NOT mean you should take it off your list—and, the reverse is equally true. Our conclusions, and ultimate choice, were based on so many unique factors—our personalities (we’re kinda weird 😉), our personal life experiences, our respective “must haves” (👇), and the compromises we had to make as a result of various realities. 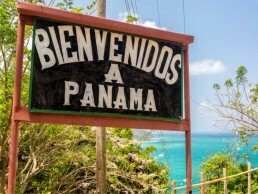 Where, oh where, shall we live our Panama expat life? As I alluded to above, what Ken and I saw, felt, heard, smelled, and tasted throughout Panamá was quite different than what we read. We’re well aware that we didn’t see every potential place in Panamá that may have checked our boxes—that’s not possible in just 10 days and was never our goal. Neither Ken nor I had a need to see it all in order to make a decision we felt good about and we were prepared for a second mission if we came up place-less on this one. Ken and I had several “must haves”—surfable waves (Ken), trees (me), abundant nature (both), some level of seclusion (both), and nothing resembling a city or suburb (both). (This is the Reader’s Digest version—if you want to know more, read our Checklist for Living Abroad). We wanted some adventure in our lives—and Panamá began delivering as soon as we got off the plane. Ken (FORTUNATELY) convinced me to invest in an all-wheel drive and chose Fox Car Rental. He was pretty proud of himself for finding such an amazing deal—only $18 per day for a Subaru Forrester! The only catch, it seemed, was that we had to take a taxi to their offsite office inside the Riande Aeropuerto Hotel, a couple miles from Tocumen International Airport. I sat on our pile of bags out front while Ken got the car. I sat…and sat…then paced…and paced. I finally dragged everything inside to find out what was up. Ken didn’t look like his usual easy going self. I got the full story a few minutes later. LESSON #2—Nobody can escape Panamá’s mandatory auto liability insurance, which adds about $18 per day onto your quoted car rental price. Somehow, Ken convinced the rental agent to allow us to waive the collision coverage despite not having the required letter—but, only if we put down a $3,000 deposit on our credit card. Even so, our car rental bill doubled—so we were feeling a bit frazzled (and hangry) when we got in the car. Without GPS. And almost no Spanish vocab. In Panama City. It had been my brilliant idea to take the SIM card advice of seasoned (and I’m sure Spanish speaking) Panamá travelers. Rather than pay the ladies at the airport kiosk $30 for a card full of data, I assured Ken it was going to be easy to find a $5 one at one of the many electronic stores near the airport. LESSON #3—If you don’t read or speak Spanish and you value your sanity and/or relationship, do NOT attempt drive in Panama City without GPS! Those SIM card ladies deserve every penny of that $25 markup. We finally gave up, hoping to find one outside of the city on the way to our first stop—Portobelo. A server at Las Canons Restaurant was our savior. Ken and I made up over clams, saltine crackers and a couple bottles of Balboa. After checking in at Hostel Wunderbar, we drove, walked, listened, smelled and tasted Portobelo. We even got to experience a full-fledged Panamanian rainfall—under a metal roof. Now THAT is an experience! We ate breakfast at a little café inside the local dive shop. It didn’t escape us that something we don’t even think twice about back home had the French owner absolutely ecstatic—she had recently been able to get her place wired to power her 220 volt imported espresso machine so she could make REAL espresso, unlike all the horrible espresso everywhere else in Panamá (her words!). Today we would drive to our second stop—the popular expat community of Coronado. On the way, we quickly decided that although we loved the little dive shop and the crazy colorful busses in Portobelo, it wasn’t our place. We just didn’t connect and weren’t thrilled about where we would have to do our shopping. While we drove, we experienced a very cool Panamanian thing—while driving on the main highway, people will go out of their way to flash their brights at oncoming traffic to warn of an upcoming speed check. This may not sound like a big deal, but there are A LOT of speed checks so this is a full-time job! It worked—no speeding tickets for us! I’ll be honest—I pretty much checked Coronado off my list as soon as I saw the McDonalds inside the attractive strip mall. Ken was on the same page—the one where we leave the U.S. behind. Our gringo-ness is probably why security waved us right through the gates of Coronado’s major suburb. To its credit, it wasn’t a perfectly manicured gated community. In fact, it was one of the places our all-wheel drive car came in handiest. But, a suburban gated community it was. After a little more walking, listening, smelling and tasting outside the gates, we hit the road for Cañas. Not much discussion needed—Coronado was definitely not our place. The part of the drive to the Azuero Peninsula that we saw before the sun went down was beautiful. As we drove slowly on the quiet dirt road into Cañas, something caught both of our eyes. WTF…THAT IS A CROCODILE!!! Crossing the road!!! There was no time to ask why as he quickly slithered down into the gully. As we lay on our Airbnb bed looking at a waterfall, I smiled…NOW we are talking! It wasn’t our original plan to blow through five places in one day, but that’s what happens when you know what you want and you’re flexible. There isn’t much town to Cañas—just a mini market and a couple of fondas (outdoor restaurants). The heart of it is the small marina that serves local fishermen and is the conduit to the Isla de Cañas preserve. It’s surrounded by beauty though—the Pacific Ocean on one side, farmland and jungle on the others. The community was just as we like it—a mix of both locals and expats. We ate breakfast at one of the fondas, then went to explore Playa Venao and Pedasi. By the time I sat down at Surf Dojo with a passionfruit smoothie, I was already crushing hard. Our smoothie chef, Anita, confirmed the good vibe we were feeling in this laid back surf community. After walking, listening and smelling the beach—and the Eco Venao reforestation “resort” across the road—I was totally enamored. The only thing that was missing was a grocery store. The drive to Pedasi took us through more picturesque farmland, coastline, and patches of jungle. About 35 minutes later, we pulled into town. It was torturous to only have a few minutes to spend in this colorful little town. It had me at the street art. There wasn’t just one grocery store, there were several. And restaurants…and some friendly looking bars…and at least one cute store and two real estate agents. While we weren’t looking to live in a town, Pedasi looked like the perfect place to shop, eat and drink! Our original plan was to spend a night or two along the Azuero coast as we explored Las Lajas and Boca Chica, but we ended up just passing through. After seeing the awesomeness of Playa Venao and the colors of Pedasi, both the town of Las Lajas and its beach felt flat to us. To get to the fishing village of Boca Chica, you pass through rolling farmland that could be Tuscany if you didn’t know better. Ken and I were already thinking this town may be another contender for our Panama expat life. Fortunately, we pulled into town at quitting time on a Friday night. You could hear the bass pounding before you even hit the first building. Although it was fun (for me) to drive through the narrow streets to blaring club music and clinking beer bottles, we didn’t even want to stay one night let alone live here. Hoping for convenience and a hot shower, we opted for a corporate hotel just off the highway in David. Unfortunately, it was Friday night, the city had a thing for sudden one-way streets, and it was too soon after our Panama City driving fiasco for it to be convenient to actually get there. LESSON #4—Don’t be counting on a warm shower when you visit Panamá. It was in David that Ken and I surrendered to cold showers. We hadn’t found a hot one yet. Despite the amount of sweat pouring out of our bodies since we arrived, we still managed to miss them. It is a testament to Panamá that I was fantasizing about how life would be without them. Something I’ll definitely be researching! After a hotel breakfast of delicious fresh local cheese, rice porridge and strong coffee, we headed to Las Olas and Playa Barqueta. We arrived to a another gated community (this one serious) and a beautiful beach with an intimidating surf—so we continued on to Puerto Armuelles. We had read the praises of Puerto Armuelles in several places—to this day, we are still shaking our heads and wondering what we missed. The town was once booming back in the days when the Chiquita Banana facility was in business. On the day we drove through it, it was quite different. We found estate homes clinging to life and tired commercial buildings. The window bars were back with a vengeance. It didn’t feel welcoming enough to get out and walk around. When we drove by the crazy Costa Rican border a few minutes later, we ran for the hills. Although Boquete was a well known expat area that was downright lush, the missing ocean meant it would only be a pleasant overnight for us on our way to Bocas del Toro. And pleasantry there was—our beers at Boquete Brewing Company, a delicious dinner at Retro Gusto, and a divine local Maracuya liqueur for dessert. I see many a weekend getaway here in our future Panama expat life! It was time to get to Almirante to catch the ferry to Bocas del Toro. The drive there was absolutely mind blowing. In the 3-1/2 hours between Boquete and Almirante, you pass through two very different provinces, an indigeneous “comarca” (itself divided into three sub-regions, nine districts and 70 corregimientos), and one of most unique and lush forest reserves I have visited in my 52 years. You begin in Boquete’s breathtaking Chiriqui Province and pass through the stunning De Fortuna Forest Reserve and indigenous Ngäbe-Buglé Comarca. In the end, you arrive in the tropical Bocas del Toro Province—most likely being chased by a man on a bike. Not a drop of rain fell on us the entire time we were on the Azuero coast, aptly nicknamed the “Dry Arc.” Now that we were back in one of the lushest areas of northern Panamá, it returned in full force. Other than a couple of quick stops—one for empanadas and one for a peek at a secluded lake—we gaped at both the rain and the reserve from inside our car. Despite the onslaught, I was beginning to think that Playa Venao may have some serious competition—we just have to find some good surf and, word has it, Bocas has it. We slowed down to a crawl in Almirante while we pondered our two options—park here and ferry to Bocas OR keep our car safe with us on the island? It soon became apparent that we were being pursued. A few minutes later, we let out our breath in a tiny parking lot. After agreeing to pay only $3/day to park our car for the next several days, our pursuer carried our bags and escorted us to the ferry. Along with a hefty tip, we thanked him for his insistence. For the next two days, we walked, swam, biked, listened, smelled and tasted Bocas del Toro. We even talked with a few people. One day, from 10 a.m. to 5 p.m., we snorkeled with bright orange star, parrot, angel and needle fish and brain and stag coral in water the temperature of a heated swimming pool. A stopover at the tiny tropical island of Isla Carenero was a highlight of our entire trip and sloths and dolphin sightings were the icing on the cake. All of this for the ridiculously reasonable price of $50 for the both of us! Our second day was spent burning serious calories while peddling thick-tired bikes up the road to Bluff Beach. Along the way, we found Skully’s, a beach with anemone shells on one side and rip tides on the other, a wayward sloth, and many places we could envision ourselves living. Airbnb failed us Casco Viejo (“Old Town”), but we found a good deal at a popular boutique hotel. Even with GPS, driving in the city is hellish courtesy of missing or mismatched road signs and many one-way streets, plazas and narrow alleys that conspire to mess with even the best of drivers. By the time we found our hotel, we were ready for some mojitos at our hotel bar. Tantalo is a breath of fresh art and serves up award-winning maracuya mojitos on a roof deck with a reputation that had even reached San Diego. We didn’t even blink when they read us the disclaimer during check in—from about 10 p.m. to the early morning hours, the hotel doubled as a club. We were staying put. Ken was slowly dying, I was iffy, and the mojitos were calling. The next day we visited the Miraflores Locks Museum at the Panama Canal—with impeccable timing. The last ship of the day was just leaving the locks. It was still fabulous. If pricey city living was the goal for our Panama expat life, Casco Viejo would be where it would happen. It’s a wonderfully eclectic blend of old and new, concrete and trees and is home to artists and artisans, musicians, bars and restaurants, a variety of interesting shops, and a breathtaking view of downtown Panama City. Even though the sights, smells, sounds and tastes were tantalizing, we love nature more. But, visit often we will. We ended the day with mojitos and cold showers. Before we returned to the airport on the very last day of our Panama Expat Life Reconnaissance Mission, we squeezed in a peaceful jungle walk on the Plantation Trail, just a few minutes from the canal. In less than an hour, we saw five agoutis, two coatimundi, four howler monkeys, one finch, one woodpecker, and a crystal blue waterfall. Did we miss some awesome places that would have checked all of our boxes? Undoubtedly. Could we be happy in one of the places we dismissed? Possibly. Did we find a place that felt like it could be home? Absolutely. In fact, we found two—Playa Venao and Bocas del Toro. During the eight hour drive from Bocas del Toro to Casco Viejo, we had the discussion that would determine the fate of our future Panama expat life. We covered accessibility, rainfall, the pros and cons of island living, and safety. But, if I’m being honest, it was ultimately a mutual gut decision. Playa Venao was our place. I was excited to start looking for property—just as soon as I got over this damn flu. Fascinating, simply fascinating. Your two areas were what I had come up with. Really liked your narrative and thought processes. WordPress isn’t recognizing my credentials so it wouldn’t let me ‘Like’ your piece but I did share it on Facebook. Interesting that what your decision came down to was more of a gut decision than your checklist. That Pacific coast area really has me intrigued. Really good advice to not accept recommendations from people who benefit financially from you. Thank you, Jim! That’s cool we came up with the same two spots out of all of Panamá—we must be kindred spirits. Stay in touch! Great blog and we can relate to many of your comments! My wife and I lived in Pedasi for 2-1/2 years and only returned to the States because of an ailing elderly relative that needed someone to care for him. While Playa Venao is great for surfers, there is no real grocery store and the road between there and Pedasi is often riddled with countless potholes (although it may be getting repaved soon, I hear). Pedasi is a wonderful, safe, and friendly little community and we just loved it. I hear these words about Pedasi a lot! Everyone seems very happy with their decision to expat there. Work is being done on the road now!!! And, the best news we’ve had is that there is a grocery store in the works for Venao…supposedly one that won’t gouge people. Hi Janet, I appreciate your blog. I am in the process of retiring and am interested in doing so in Panama. Like you, I’m looking for a non-city/suburb area. I checked the map for the locales you narrowed the choices down to and I think the Venao area looks good. However, instead of surfing, my activity would center around fishing, mostly from a kayak. Would you mind elaborating on that city? Playa Venao and Cañas are EXCELLENT locations for fishing! Ken is an avid fisherman and this was an additional pull for him (that I totally forgot to mention). The nickname for the Azuero Peninsula is the “Tuna Coast”—I’m not a fisherperson so excuse my lingo, but apparently the deep shelf in the ocean comes very close to the shore here so you don’t have to go out far to catch BIG fish. In fact, I’ve seen some huge ones caught off the shore! When you come to visit, I recommend you talk to Carlos with Playa Venao Fishing…knowledgable AND really good guy. I think the ocean waves wouldn’t work for fishing from a kayak, but the fishing is EXCELLENT in a regular boat. Janet, great blog. My husband and I have lived in Pedasí for over 3 years and it’s the best decision we have ever made. We are building a condo in Playa Venao for our weekend getaways. One of the best features of these two areas is the dining! We have over 40 world class restaurants and top chefs. The only other place you will find such delicious food would be in Panama City. We are also looking forward to more families wth kids due to an excellent new private school! So great to hear! We had dinner recent at Panga and LOVED it!!! Been to several other delicious places and I’m excited to try more. So happy schools are figuring out how needed they are down there. well done! I Canadian, I have been living here for ten years. In the city for work and other projects but have spent much time in all the areas you mentioned. I think you’ll do just fine in the Azuero, we’ll see you around! Thank you! Look forward to meeting you—hopefully not for mold control, but I do have you down as the man to call if we have any problems!